The primary Interactive Benefits Guide DDA Medical developed for the American College of Physicians (ACP) was built using DDA Medical's SmartSite™ technology and platform. The Interactive Benefits Guide included a multi-tabbed, easy-to-read menu system, three different spokespeople with synchronized text and images, and hyperlinks to ACP's website, along with an Add-to-My-Library feature. The main objective of the Interactive Benefits Guide was threefold: an updated welcoming kit for new physician members; a tool for new member recruitment; and a method to improve retention rates of new members ages 30 to 40. In order to reach this younger demographic, particularly those members and prospects on the go, DDA Medical raised the issue of mobile compatibility. However, the primary tool was built in Flash and, therefore, was not inherently compatible on the iPad®, iPhone®, and smartphones. The challenge was to build an iPad-, iPhone-, and smartphone-friendly version of the primary tool. The development of the mobile version presented some new objectives for the Interactive Benefits Guide that pertained to site architecture, design, touch navigation, and programming. DDA Medical was asked to develop a new Apple®-friendly/mobile architecture based on the established plan for the primary version. DDA Medical's objective was to create a custom design for the tool - one that would coordinate with and be complementary to the primary version. DDA Medical also needed to organize all content and information in a touch format and perform all custom programming necessary to make the tool function on the iPad, iPhone, and smartphones. DDA Medical developed the tool using a touch navigation system to allow users with a touch phone the ability to use the tool in the customary swipe style. Due to display size and compatibility, the mobile version was not designed with a one-page menu system with synched video, text, and images. Instead, the menu was designed to include nine task items with an option to view the welcome video. Selecting a task presents the user with a list of the modules in that section and the ability to view an overview video for that task. Selecting a module brings up another video for that topic and a third menu with additional content pages. The navigation of the mobile-compatible Interactive Benefits Guide is simple and intuitive - a perfect combination for the user on the go. This version of the Benefits Guide comes complete with a mobile detect feature, so that tablet or smartphone users are presented with a display ideal for their particular mobile device. 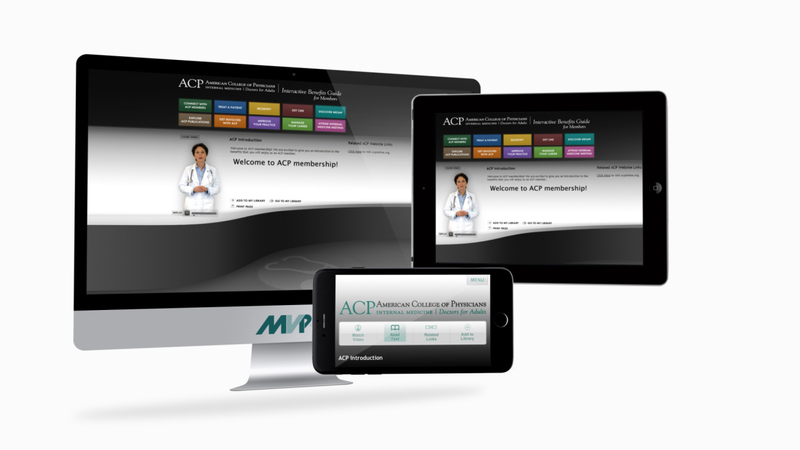 Today, ACP is able to provide new and existing members with all of their benefits information in an organized, engaging way, and in both online and mobile formats for all users.